A votre tour! 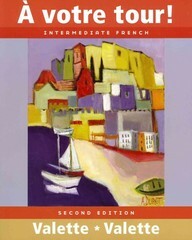 Intermediate French 2 Edition The main objective of À votre tour! is to bring readers to a level where they can comfortably express themselves on a variety of French and francophone topics. Avoiding the excessive rigor of most intermediate texts, À votre tour! immerses readers in authentic language and cultural contexts to achieve three key objectives: to build and reinforce oral and written communication skills, to develop reading skills and cultural awareness, and to forge a strong linguistic base.